Mobile apps have become an integral part of the digital landscape, as they are being used for a wide variety of purposes such as playing games, getting information, entertainment, booking tickets, accessing various tools and services, carrying out banking transactions, etc. However, due to the limited screen size of mobile devices, users often feel the need to access mobile apps on their PC or laptop. This is especially true in case of specific apps such as games, chat, live TV, movies, etc. The need to access mobile apps on PC also arises from the fact that the keyboard and mouse are more convenient and easier to use, as compared to the tiny touchscreen buttons on mobile devices. 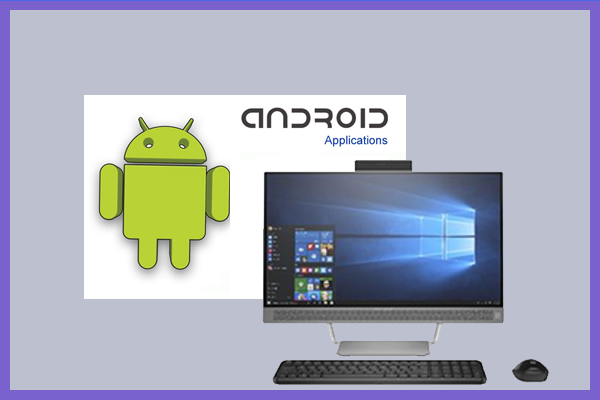 To access and use Android apps on your PC or laptop, you will need an Android Emulator. It may be noted that the top tech companies in the world have stayed away from developing android emulators and it’s the smaller tech firms that are dabbling in this domain. The primary reason for the disinterest of top tech companies in developing android emulator is that these companies don’t want to discourage the use of mobile devices. The simple logic is that if everyone starts using android apps on PC, the market for mobile devices would be hit. Moreover, there are security concerns as well since mobile devices are considered relatively safer, as compared to a PC or laptop. Since only the smaller tech firms have developed android emulators, there’s often a big question whether their products are reliable or not. There have been user reviews that talk about adware being installed along with the android emulators. So, before installing an android emulator on your PC or laptop, it is recommended that you carry out a thorough research. Given below are some of the most popular android emulators for PC. Bluestacks: Do you need to test out Android apps before installing them on your device or just want to use the same apps on both your Android device and your computer, check out the free BlueStacks App Player. This software allows computers and tablets to run Android apps. The App Player also allows computers and tablets to install apps synced from an Android device thanks to the company’s Android-based Cloud Connect technology. Users simply need to download and install the free App Player to the PC, and the free Cloud Connect app to an Android device. The apps that came pre-installed can be run full-screen or in a window. Naturally because they’re designed for a touch interface, users might want to use a touch-based all-in-one PC, a laptop with a multi-touch pad or tablet, yet they’re still functional when using the standard mouse and keyboard. This is probably the most widely used android emulator in the world. It claims to have 210 million users globally. Bluestacks works on both Windows PC and Mac. Bluestacks is free to use, but there are charges for advanced features and functionalities. Andy: This is another software that is also convenient to perform what you need. According to their review on Softonic website they claim to be the best compared to Bluestack. Want to run Android on a PC? Andy OS allows you to do just that, emulating the complete Android experience on your desktop. Unlike BlueStacks, which is merely a launcher for Android applications, Andy OS gives you complete access to Google’s operating system. You can download and install apps and games through Google Play, or side-load APKs and run them through the Andy OS. This is particularly useful for using messaging apps like WhatsApp, Viber, or LINE from your desktop. But there’s much more to Andy OS than just running apps: the software also supports notifications, widgets, file browsing (including access to the local file system), application data syncing, and full multi-touch gestures. At the time of writing, Andy OS runs Android Jelly Bean 4.2.2. While it’s a shame it isn’t pre-installed with the latest OS (KitKat 4.4), it’s up to date enough that it should run most apps. Andy OS isn’t quite as simple to use as BlueStacks, in the sense that it requires a little bit more setup. That said, it’s still very easy. Andy OS runs through Virtual Box virtual machine, which comes bundled with the installer. Once you’ve downloaded and installed the software, you simply run the application and go through the Android configuration options as you would on a first-run of a regular mobile device. I experienced the occasional glitch when running the application, although in general it works pretty smoothly. Andy OS is great for ‘power users’ because it can be customized in a number of ways. For starters, you can change the way it runs in the virtual machine, allocating more RAM for example, to make it run faster. But you can also root the Android operating system through Andy OS, allowing you more customization within the OS itself. If you want to install custom ROMs or change to a different launcher, you can. Andy OS is pretty simple to set up, high in customization , and gives you a complete Android experience. If you just want to play popular casual games or run simple apps, BlueStacks is a more hassle-free solution. But if you want to properly emulate Android on Windows, call on Andy OS. This provides seamless connectivity between computer and mobile devices. It can be used to access android apps on both Windows PC and Mac. Some top features include full android UI, multi-touch support, cloud storage, camera integration, desktop push notification, etc. Andy is free for standard use, but there are charges in case anyone wants to have developers support. Ko Player: This is a favorite among gamers, as it supports most of the popular gaming apps available on Google Play. However, Ko Player supports only Windows PC, which is a disappointment for Mac users. Ko Player offers advanced features such as OpenGL & hardware acceleration, which allows for improved stability and faster rendering, as needed for gaming apps. Ko Player is free to use. Memu: This one claims to be better than Bluestacks, owing to its high performance configuration for gaming apps. Memu is one of the few android emulators that are compatible with AMD based computers. Memu is free to use. It claims to have 15 million users across the globe. Nox: This android emulator offers smooth game play and superior compatibility, which is great for gaming apps. Nox offers improved keyboard control, smart-casting and FPS support, which make gaming a delightful experience on PC. Nox claims to have 150 million users across the globe. There are several other android emulators available for download. However, since these are developed by lesser known tech firms, make sure you read user reviews before downloading and installing these products. Do not forget to like and share with friends via social network.